The Reserve Bank of Australia has announced its decision on the November cash rate. The rate would be staying the same at 1.50%. The rate has now been the same for 27 consecutive months and many analysts believe it will remain at this rate into 2019 and possibly to 2020. This announcement was mostly expected from the industry, with 98% of brokers believing it would remain the same, according to an industry survey. The RBA shadow board also attached a 53% confidence that the rate would remain the same. 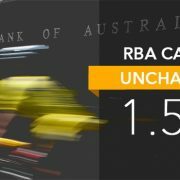 The RBA governor has previously said the next move of the cash rate will be a hike, however some analysts are now suggesting the environment at the moment could call for a decrease. AMP’s Shane Oliver had said, “The fall in the official unemployment rate to 5% helped by above trend economic growth is good news. Seller expectations are high but buyers want low prices – what’s to be done? Two real estate agents detail how to negotiate in a declining housing market. From a vendor’s point of view, it’s crucial that you price your property correctly from the start. The most incredible homes in the world won’t sell if they’re overpriced.